Why nor hear from an expert? How much oil is left in the world? Let’s hear from an expert who has no agenda otther than sharing the facts. If you want to see the obstacles, perhaps you could look into why the earlier generations of bio-fuels didn't use plant residue. I mean, it the obvious thing, isn't it? Get fuel from these mountains of waste, rather than starve people in poor countries by driving the price of grain through the roof. Surely that would be the first step? It wasn't, and not without cause. Yes it would be nice, but only if weren’t for the law as of chemistry and physics it would be a fantastic solution as would word peace, feeding the hungry and ending homeless. Only problem with bio is why one does the energy calculations it just dosn’t scale. And then there’s the issue of cost. How much are the bio-fuel producers paying the farmers per gallon of fuel being produced from what they have grown? Expert in what? Speaking narrative on youtube? Not to say he said a lot of false information, at least in second video which I partially watched. It isn't easy to convert cellulose into ethanol so that is why the earlier methods are based on how beer & whine have been made for centuries. Nowadays over a dozen of companies are working on this and several have the first large scale factories which can convert cellulose into ethanol up & running. Basically the technology for third generation bio-fuels based on plant waste is out of the laboratory stage. Its actually really easy to convert cellulose to ethanol. That isn't the problem. The problem is the energy calculations. They need to put vast amounts of energy into the conversion. This is not an industry process efficiency issue. Its the basic chemistry, which won't change. So, you now have something that might make sense as a an energy storage mechanism for non-persistent renewable energy, like solar or wind, but you don't have a primary fuel. Its actually really easy to convert cellulose to ethanol. That isn't the problem. The problem is the energy calculations. They need to put vast amounts of energy into the conversion. This is not an industry process efficiency issue. There are several methods and I strongly doubt the modern plants will use an energy inefficient one. The DSM part of Poet-DSM has developed a special enzym to break down cellulose. You do understand enough chemistry to realise that you only get from ash to fuel by pumping in a lot of energy, don't you? Various groups have developed enzymes and bacteria to make the conversion of plant waste to fuel more of a high throughput industrial process, but you can't beat the basic physics of chemical bond energies. I think the misunderstanding is at your side. Cellulose is a hydrogen / carbon chain just like Ethanol. You don't need to go from ash to fuel you just need to re-arrange a few atoms in a molecule. The energy present in the cellulose doesn't dissapear. From what I have read, energy spent to produce needed enzymes is so high, whole process becomes energy negative. But then it wouldn't make sense to build mass production factories. But the factories are there so I guess some have solved that problem. Expert in what? Making slick youtube videos to attract viewers? He's certainly not an expert in world oil reserves. The IEA and BP oil on the other hand ARE and I've repeatedly posted links with their numbers which are in agreement with others which can be found many places on the net. You continue to ignore those links. Are you saying the IEA and BP are wrong? In second video at 4:45 he said that global renewable energy share is 2.8% which total BS and is order of magnitude off the real number. I've not watched the video, was he talking about electrical generation mix (which is clearly >>2.8%) or total world energy use? The latter includes transportation (dominated by oil), steelmaking (dominated by coal) and cement manufacture (gas/oil/coal depending on kiln design) amongst others and 2.8% is rather more believable. You are ignoring the fact that the third generation bio-fuels will piggy back onto food production (and use other plant residu) so those fertilizers will be needed anyway. No I'm not. You asked why fossil fuels would be needed for biofuels and I answered. Of course, fossil fuels are also required to produce the current large food crop yields. Besides that it isn't a given that fertilizers (which will be needed for food production) have to be made from fossil fuel. It's not? Please provide information on another way to produce large amounts of Nitrogen containing fertilizers or some other substitute. Biofuels will likely play a small role in the future - they will have to if we want planes to fly. The military will and is seeing to that. This is despite the fact that at best the current large scale biofuel production has at best a net energy balance of 1.25 and requires large fossil fuel inputs. Look, it's really not that complicated. 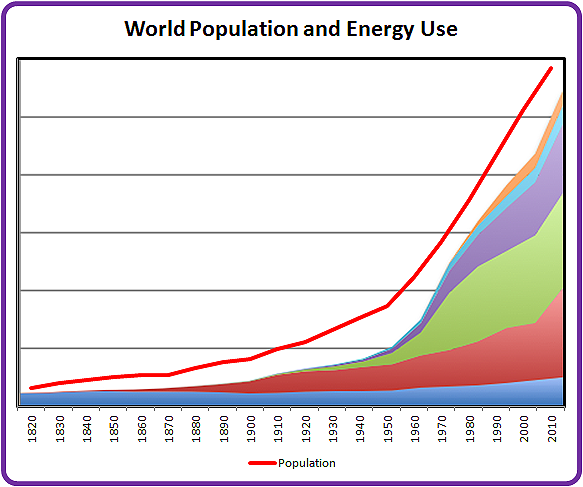 The ONLY reason world population has been able to grow exponentially over the past 100 years is due to the discovery and utilization of millions of years of stored solar energy in the form of fossil fuels. We've almost exhausted the easily extracted portion of that resource and even much of the difficult to extract portion. It's a basic ecological principle that population is directly proportional to energy utilization. The bottom line is we've far exceeded the carrying capacity of the planet and the only reason the overshoot has been able to proceed so far is due to the discovery and utilization of a FINITE high density energy store. Source of figures which is him. What is needed is Ammonia which can also be gotton from other places besides fossil fuels. Duh. Of course. There are many sources of nitrogen. Of course plant growth does not require fossil fuel inputs. Duh. The point is that large scale production of nitrogen fertilizer cannot be accomplished without large inputs of natural gas as well as petrochemical based insecticides, herbicides and fungacides. And large scale mechanized farming and crop transport requires large oil (gasoline/diesel) inputs. The "green revolution" that began in the 1940s and has allowed large increase in crop yields was only possible because of the utilization of large fossil fuel inputs. Renewable energy is around 10% of primary energy consumption and around 20% of final energy consumption. All energy, not just electrical. The point is that large scale production of nitrogen fertilizer cannot be accomplished without large inputs of natural gas. And large scale mechanized farming and crop transport requires large oil (gasoline/diesel) inputs. But that still doesn't say it cannot be done without use of fossil fuels. Currently using natural gas is the most economic way to make fertilizer. But again: not the only way! The same goes for farming & transportation. Of course. No one said it could not. You seem to be missing the point which is that producing biofuels on a scale large enough to replace gasoline and diesel at anywhere close to current use levels is impossible without large fossil fuel inputs. That is your opinion based on processes which are economic in the current situation. There is a difference between more expensive and impossible. What you are saying is that fertilizer made from something else than natural gas (which is only used to produce the ingredient Ammonia) is more expensive given the current prices of natural gas. Well, that is only logical. 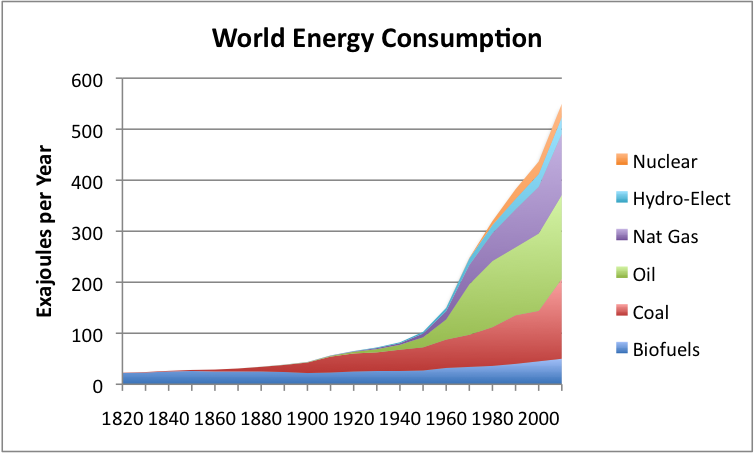 Basically you are making my point when I say 3rd generation bio-fuels are the way to go. When fertilizer becomes more expensive more parts of the plant will need to be used which is where 3rd generation bio-fuels will help to keep food prices low. After all 'we' will need to continue to grow food one way or another. BTW: one part you have missed in my previous posts is that fuel consumption also needs to go down. The US could easely reduce it's fuel consumption by half by switching to more efficient cars. In Europe probably around 30% of fuel can be saved. This is something people can do today. That is your opinion based on processes which are economic in the current situation. No, it is not an opinion. It is a well established fact that current agriculture is highly dependent on fossil fuel inputs. It's not just a matter of economics. There are simply no methods currently to produce biofuels on a large scale without large fossil fuel inputs. Period. Full stop. It is your wishful thinking that mythical "3rd gen" biofuels will allow that but you've offered no evidence of that. fuel consumption also needs to go down. They should require all new cars to get at least 30 MPG highway. That is already achievable without any exotic technology. Then gradually increase the requirement over time so it doesn't stagnate. You are still ignoring that 3rd generation bio-fuels don't need any fertilizer because it piggy-bags along with food production (which does need fertilizer). The raw material comes for free along with the food! I'm staggered how deeply embedded the thought is that we need to grow crops specifically for bio-fuels. WE DON'T! That is the whole beauty of 3rd generation bio-fuels.